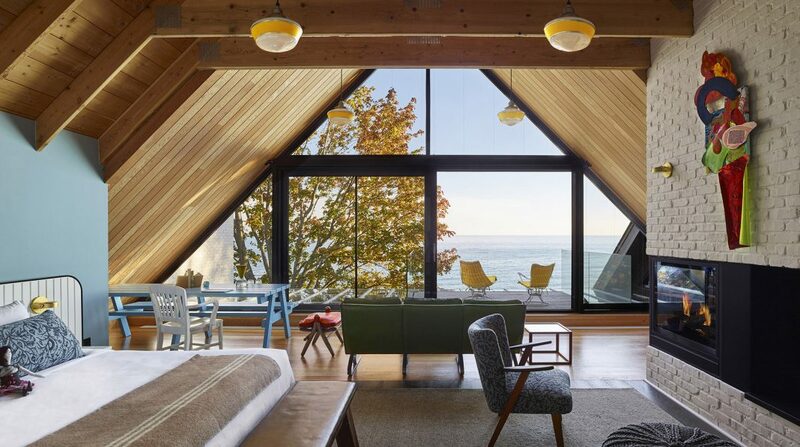 The Owner’s Suite at Drake Devonshire features original artwork and an amazing view. Idyllic vineyards, farm-to-table dining, and a vibrant art scene beckon. Charming Prince Edward County—not to be confused with Prince Edward Island—has long been revered for its historic towns, arts scene, and antique stores. More recently, it has transformed into a successful wine country, an incredible feat for a region once thought incapable of harvesting grapes. Today, one of Canada’s fastest-growing wine regions serves as a gastronomic paradise. Nestled in the Ontarian countryside, a scenic two-hour drive east from Toronto, it’s a little slice of Tuscany in the Great White North. 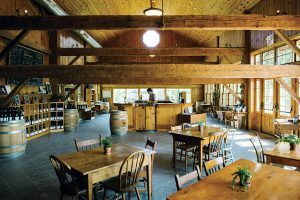 Grange Winery offers tours and food baskets to go with your bottles. With its rolling hills and scenic views, the Grange Winery is a prime spot to picnic in the backdrop of postcard-perfect farmland. Visitors can buy a basket loaded with local delights ($35) and lunch on a limestone patio or patch of grass. Baskets include local cheeses, charcuterie, bread, popcorn, wine jelly, and maple tarts. Pair your meal with the Grange’s varietal wine and stay after lunch to tour the estate’s barrel cellar. Learn to whip up a countryside meal at From the Farm Cooking School, which offers hands-on classes ($125 and up) inside a heritage farmhouse. The school uses locally sourced food to teach students to make tapas, Indian curries, and Mediterranean favorites. Book an all-day culinary adventure to explore the county with chef Cynthia Peters. You’ll visit local farms and produce stands, and meet the farmers who harvested your ingredients. Explore the county’s idyllic vineyards, shorelines, and historic sites on a horse-drawn trolley. The County Carriage Co. offers a memorable wine-tasting experience by chauffeuring guests to several of the region’s finest vineyards. Wine tours last four hours ($100 and up), enhanced by the narration of local history. 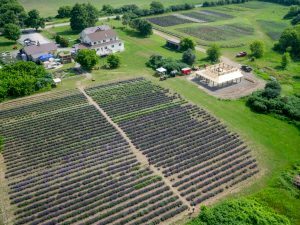 The fields at Prince Edward County Lavender are the source for lavender gelato and soaps at the on-site store. A purple paradise awaits at Prince Edward County Lavender, a farm loaded with fields of lavender cultivars. During the peak season (late June through July), visitors can soak in the sights and scents of the harvest. When the fields are dormant, the indelible fragrance of lavender floods an on-site store, which sells lavender gelato, lavender-infused soaps, and more. The best of Prince Edward County’s thriving arts scene is showcased at Mad Dog Gallery. The studio features the traditional and contemporary work of local artists. Soapstone carvings, hand-blown glass, and reclaimed wood art are among the items on display. The gallery is inside a renovated, timber-framed barn. Tucked among clusters of pinot grapevines is the chic-yet-cozy Inn at Huff Estates. The inn’s winemaker’s suite ($269 and up) features a wraparound patio with a panoramic view of the lush vineyards. Guests get complimentary tastings and tours, where they’ll see state-of-the-art winemaking facilities. Explore the countryside on horseback at Diamond J. Ranch, open from May through late October, by embarking on a 2-mile trail ride. The hour-long journey ($69) offers a great view of Picton Bay and the chance to spot frolicking wildlife. With its modern industrial decor and laid-back vibe, Midtown Brewery Co. is a locals’ favorite. The meatpacking factory-turned-microbrewery serves local ales, ciders, and wines, as well as a seasonal assortment of pub fare. Also on tap are an extra special bitter and German stout, which are made on-site.